BACKGROUND AND PURPOSE: Complex and syndromic craniosynostosis can be complicated by raised intracranial pressure (ICP), which in the absence of other identifiable origins, is probably caused by venous hypertension. Children with these conditions have been shown to have narrowing of the sigmoid sinus‐jugular vein complex. Evidence of bony narrowing of the jugular foramina in children with complex or syndromic craniosynostosis and raised ICP compared with that in children with craniosynostosis without raised ICP would provide support for the theory that venous hypertension occurs in the former children. METHODS: Measurements of the jugular foramina were obtained from reformatted helical CT scans obtained in 12 children with complex or syndromic craniosynostosis and raised ICP (group 1) and in two control groups of children with normal ICP. The first control group comprised 10 children with simple nonsyndromic synostosis of one or two sutures (group 2), and the second control group included nine children with complex or syndromic craniosynostosis (group 3). RESULTS: Children with raised ICP had narrower jugular foramina than did the age-matched control subjects. For group 1, the mean diameter of jugular foramina was 6.5 mm; group 2, 11.5 mm (P < .01); and group 3, 10 mm (P < .05). No significant difference existed between the two control groups. CONCLUSION: Significantly narrower jugular foramina in children with raised ICP is further evidence of the role of venous outflow obstruction and intracranial venous hypertension in the development of raised ICP in complex and syndromic craniosynostosis. Raised intracranial pressure (ICP) may occur with craniosynostosis (1). The association is strongest in syndromic forms of craniosynostosis, particularly Crouzon or Pfeiffer syndromes. Few cases of single-suture craniosynostosis may also be affected (2), although the causes of raised ICP in complex or syndromic and single-suture craniosynostosis are not necessarily the same. Various causes have been proposed for raised ICP in complex and syndromic craniosynostosis, including craniocerebral disproportion, cerebellar tonsillar herniation, hydrocephalus other than that from intracranial venous hypertension, respiratory obstruction from midface hypoplasia in syndromic forms, and restriction of venous outflow through the intracranial compartment. No consistent relationship has been shown between raised ICP and restricted intracranial volume (3–5) or between hindbrain herniation and hydrocephalus (6). Increasing evidence that venous hypertension can be associated with raised ICP (7) and ventricular enlargement (8) in craniosynostosis is presented in the current literature. Although early studies were not always conclusive regarding the role of jugular foramen stenosis as a cause of intracranial venous hypertension, the link between venous hypertension, hydrocephalus, and jugular foramen stenosis is now a recognized feature of achondroplasia (9–11). In achondroplasia, preferential narrowing of the jugular foramina and foramen magnum occurs. Presumably as a consequence of jugular vein stenosis, persistence and enlargement of fetal venous anastomoses occur in the posterior cranial fossa and also opening of collateral venous pathways to allow drainage from the intracranial compartment. Obstruction of venous outflow from the posterior cranial fossa and dilated collateral emissary veins have also been shown by conventional and MR angiography in children with craniosynostosis and hydrocephalus from other causes (8, 12, 13). Examples have been published of children with syndromic craniosynostosis and stenosed jugular foramina with complications related to the presence of dilated collateral venous emissary vessels and raised ICP (14, 15). Evidence of bony narrowing of the jugular foramina in children with complex or syndromic craniosynostosis and raised ICP compared with that in children with craniosynostosis and normal ICP would provide support for the theory that venous hypertension occurs in these children. This issue requires clarification so that treatment of raised ICP in appropriate patients can be directed at improving intracranial venous drainage rather than at vault expansion or CSF diversion procedures. Children referred to the Craniofacial Centre with complex or syndromic craniosynostosis routinely undergo CT as part of their diagnostic and preoperative assessment. Since 1996, images of the skull have been obtained by a helical technique on a Somatom Plus 4 CT scanner (Siemens, Erlangen, Germany) with 2-mm collimation and a pitch of 1.5 through the skull base and face. The vault is scanned using a pitch of 1 to avoid a step artifact on the 3D reconstructed images. For 12 of the patients with complex craniosynostosis and raised ICP, who presented since this imaging protocol was instituted, the imaging data sets were archived in a form accessible for retrospective analysis of the skull base by means of multiplanar reformatted images. These 12 children formed the study group (age range, 2 months to 10 years 10 months; mean age, 3 years 7 months). Eleven children had syndromic craniosynostosis (five with Apert, four with Pfeiffer, one with Crouzon, and one with Saethre-Chotzen syndrome) and one had nonsyndromic complex craniosynostosis. Raised ICP was found in 10 cases on the basis of monitoring ICP during a 24-hour period by using a Camino fiber optic device (Camino Laboratories, San Diego, CA) placed in the subdural space with the patient under general anesthesia. In the remaining two cases, raised ICP was identified on the basis of clinical examination (papilledema). No patient had active hydrocephalus (progressive ventricular enlargement) at the time of the study. Two control groups were drawn from children referred to the Craniofacial Centre who had normal ICP. The first group included patients with simple, nonsyndromic synostosis of one or two sutures and no clinical evidence of raised ICP. CT data were accessible for review in 10 suitable cases. Eight children had unicoronal and two had bicoronal craniosynostosis (age range, 2 months to 6 years; mean age, 2 years 3 months). The second control group comprised children with complex or syndromic craniosynostosis who had been shown by ICP monitoring to have normal ICP. Nine children comprised this group; five in the group had undergone CT twice. Eight children had syndromic craniosynostosis (three with Apert, three with Crouzon, one with Apert-like, and one with Saethre-Chotzen syndrome) and one with nonsyndromic complex craniosynostosis (age range, 6 months to 12 years 11 months; mean age, 5 years 6 months). In each of these cases, the earliest available CT scans were used for comparative analysis. Both control groups were age matched as closely as possible with the study group, but we were limited by the availability of patients who filled the aforementioned criteria. A single pediatric neuroradiologist (P.M.R.) undertook all the image manipulation and measurements, in random order, without reference to clinical details at the time the data were acquired. Multiplanar reformatted images of the skull base were created to allow measurement of the jugular foramina. A set of reformatted parasagittal images was obtained in the line of the jugular foramen, or if the foramen was very tortuous, this was achieved by using freehand drawing and a curved reformat. The second set of images was obtained in a plane orthogonal to the parasagittal images by using the latter as a template (Fig 1). The anatomic plane of the second set of images depended on the orientation of the jugular foramen: axial if the foramen ran horizontally or reformatted coronal-oblique if not. 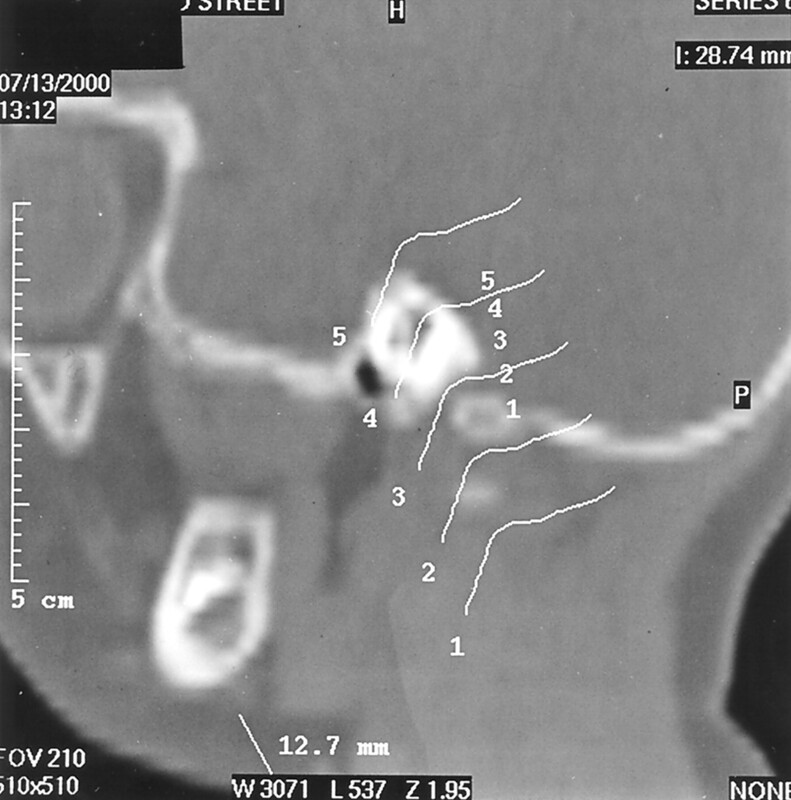 The narrowest point of each foramen was determined by visual inspection of the images, and measurements of the diameter of the foramen at this point were obtained from each of the images (Fig 2). Thus, two orthogonal measurements of the narrowest point of each jugular foramen were obtained, in a parasagittal plane and a second plane orthogonal to the first, be it axial or reformatted coronal-oblique, depending on the exact orientation of the first image plane. Parasagittal reformatted CT scan obtained through the jugular foramen shows curved line template for production of second reformatted image in the orthogonal plane (lines have been separated for clarity, but during the study, they were all grouped with the foramen). Parasagittal reformatted image (left) produced from an axial CT scan (right). These show measurements of the right jugular foramen in two orthogonal planes (control group 2, patient 9). For ease of comparison, the mean of the two measurements was calculated, and from these values, a figure for the combined mean diameter of both foramina in each patient was produced. This number was rounded to the nearest 0.5 mm to allow for the spatial resolution of the CT reconstructions. For three of the patients in the study group, venous imaging from conventional angiography was available for review (group 1: patients 1, 6, and 12). Wilcoxon’s rank sum test was used for statistical analysis of the differences between the whole groups and the differences between the approximately age-matched subgroups. P < .05 was regarded as significant. Full data are presented in tabulated form (Tables 1–3). The combined mean diameter of the jugular foramina for all the patients in each group was 6.5 mm in the study group (group 1), 11.5 mm in the simple craniosynostosis control group (group 2), and 10 mm in the control group of patients with complex or syndromic craniosynostosis but normal ICP (group 3). Significant differences existed between the study group and each of the control groups (group 1 versus group 2, P < .01; group 1 versus group 3, P < .05) (Figs 3 and 4). 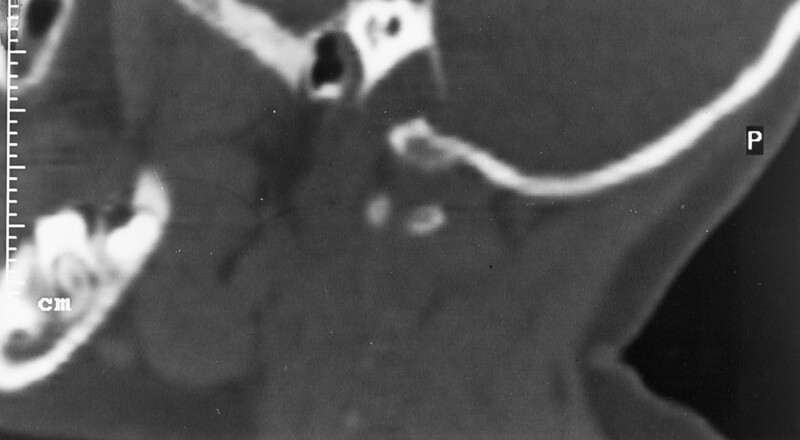 A, Axial CT scan (study group, patient 5) shows bilateral jugular foramen stenosis and enlarged transosseous emissary foramina in a case of Apert syndrome. The patient has a ventriculoperitoneal shunt (curved arrow). 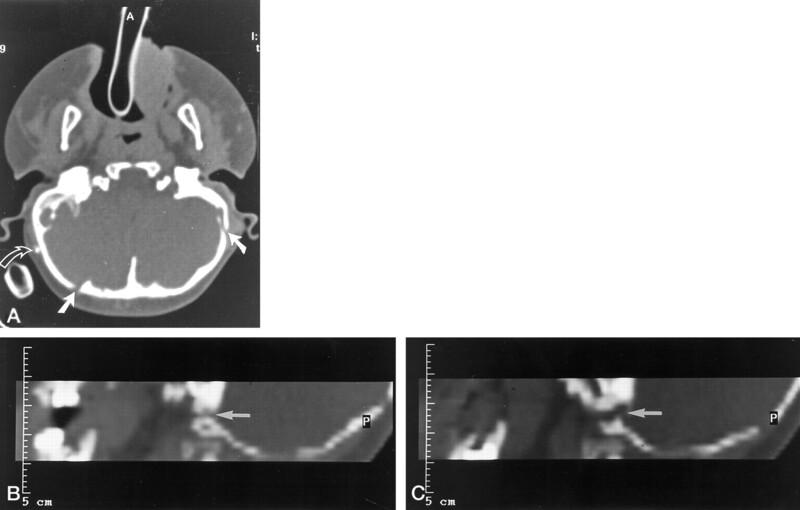 B and C, Parasagittal reformatted CT scans of the same patient show narrowed and tortuous jugular foramina (arrows) (compare with Fig 4). Parasagittal reformatted CT scan obtained through a normal jugular foramen. Some discrepancy existed between the ages of the patients in the different groups, particularly between group 3 and the other two groups, and because it is possible (7, 16) that the pattern of bony abnormality can change with age, an attempt was made to age match subgroups so that more detailed comparisons could be made. If only patients at or younger than 6 years were considered in the study group and group 2, inclusion of all except the oldest three patients in the study group and the whole of the control group was allowed. A significant difference in combined mean diameter of the jugular foramina was still noted between these subgroups (5 versus 11.5 mm; P < .001), as between the study group and the control group 3 (5 versus 9.5 mm; P < .05). Similarly, when comparing only children at or younger than 3 years, the differences between groups 1 and 2 (5.5 vs 10 mm; P < .05) and groups 1 and 3 (5.5 vs 10 mm; P < .05) were still significant. The differences between the combined mean diameters in control groups 2 and 3 were not significant, either between the whole groups (11.5 versus 10 mm) or between the subgroups of subjects at or younger than 3 years (10.5 versus 10 mm) or 6 years (11.5 versus 9.5 mm). Venous imaging was reviewed for patients 1, 6, and 12 of the study group. Patient 1 underwent angiography at 2 years old. The jugular bulbs were patent. Mastoid emissary veins were seen bilaterally. Patient 6 also underwent angiography at 2 years old; a patent right jugular bulb but an occluded left jugular bulbtransosseous segment and extensive collateral emissary vessels were discovered. Patient 12 underwent angiography at 9 years old; jugular bulbs were patent, and stylomastoid emissary veins and transosseous drainage from the sagittal sinus was evident. In our study, children with complex or syndromic craniosynostosis and raised ICP had significantly narrower jugular foramina than did children with simple craniosynostosis and normal ICP. This might have been predicted, because children with complex craniosynostosis inevitably have severe abnormalities of the skull base. However, and perhaps more interestingly, when we compared our study group of children with complex craniosynostosis and raised ICP with a separate control group of children who also had complex craniosynostosis but normal ICP, the group with raised ICP had significantly narrower foramina than did the control group. We deliberately chose a simple measuring technique for assessment of the narrowest point of the jugular foramina, enabling rapid comparison among patients. A recently published series of patients (13) with syndromic craniosynostosis and stenosed or atretic jugular foramina used a more complex measurement, the cross-sectional area of the jugular foramina and further measurements of emissary channels. A large normal control group was included in that study, and anecdotal observations (14, 17) of an association between enlarged basal emissary foramina and jugular foramen stenosis in craniosynostosis were confirmed. Hydrocephalus was found in some of their patients with jugular foramen stenosis and enlarged emissary foramina and also in patients with normal jugular foramina but enlarged emissary foramina. Hydrocephalus did not occur in patients with normal jugular foramina and no enlargement of emissary channels occurred, supporting the supposition that hydrocephalus is caused by intracranial venous hypertension in craniosynostosis. Venous imaging revealed jugular vein stenoses in some patients, although no specific correlation was made with raised ICP. The method used in that study, however, still falls short of exact quantification of venous outflow pathways. Every neural and arterial foramen in the skull base transmits veins that communicate with extracranial and vertebral venous networks, and this complex can be regarded as one large venous plexus enmeshing the sphenoid and occipital bones (18). It thus becomes impossible to account for every relevant vessel. We concentrated on the most important route of drainage, basing our theory on the simple assumption that flow through a tube is limited by the narrowest point in the tube. All three of the venograms available for review from our patients with raised ICP were abnormal. Although two patients (patients 1 and 12) had patent jugular bulbs and transosseous jugular segments, they had both developed abnormally large additional emissary veins, suggesting inadequacy of normal venous drainage pathways. The third patient (patient 6) had unilateral jugular atresia, and again, extensive collateralization. In this case, a greater discrepancy existed than in the other two cases between the size of the jugular foramen on the side of the atretic vein compared with that of patients in the simple craniosynostosis control group. Of note is that although the second, complex, control group was found to have significantly larger jugular foramina than those in the study group, in individual cases, some foramina were also rather narrow. This suggests that in some cases, it is the capacity to develop collateral venous drainage rather than the patency of the usual routes, such as the jugular foramina, that determines whether raised ICP occurs. This is consistent with the finding of enlarged emissary foramina in similar patients in the aforementioned study (13). Considering that intracranial venous drainage is usually transmitted through various portals in the skull base, the development of dilated collateral veins despite angiographically normal jugular bulbs and transosseous jugular segments can be explained. Complex craniosynostosis inevitably involves distortion of the skull base and therefore interruption of at least some of the numerous normal emissary routes of venous drainage, even if the jugular foramina are not severely affected. This might explain why emissary vessel enlargement is so variable. However, our results also imply that jugular venous outflow obstruction has a major role in the genesis of raised ICP. The jugular bulb develops after birth (19), and in early infancy, alternative emissary veins have a more important functional role than after establishment of a more adult pattern of jugular venous drainage. Our individual jugular foramen measurements show a greater discrepancy between the study and control groups for children older than 1 year, when this is likely to be more hemodynamically significant, than in the individual patients examined during the 1st year of life. This correlates with the occurrence of raised ICP in children with complex craniosynostosis, most commonly during the 2nd year of life. The previously mentioned tendency toward normalization of ICP at approximately 6 years of age (7) may be due to maturation of collateral emissary veins. Some early studies (including those in animal subjects) seemed to show an inconsistent relationship between jugular foramen narrowing, venous hypertension, and raised intracranial pressure and also addressed the question of whether intracranial venous hypertension is a cause or effect of raised ICP. Steinbok et al (10) undertook a careful review of this work, and they argued that more recent and definitive studies favored the view that jugular foramen stenosis is a cause of venous outflow obstruction, and therefore, intracranial venous hypertension and hydrocephalus. They performed experiments in children with achondroplasia that supported this theory. This position has also been adopted by others (11, 12, 20), including Sainte-Rose et al (8), whose work very strongly supports the notion that intracranial venous hypertension in the setting of foraminal stenosis is not secondary to raised intraventricular pressure and may be relieved by venous bypass. The latter study included cases of achondroplasia and also craniosynostosis. Our control group of children with complex craniosynostosis included five patients who had undergone CT twice, at intervals of between 7 and 22 months. In two cases, the foramina were slightly larger on the second scan; in two, the combined mean diameter was the same; and in one, the combined mean diameter was fractionally less. Whether this represents a genuine increase in the severity of stenosis or simply reflects the tolerance limit of our measuring technique cannot be determined on the basis of a single case. The normal ranges for a jugular foramen cross-sectional area from the aforementioned study (13) do show a gradual increase in the predicted value of the mean area of the foramina between the ages of 1 month and 16 years. However, the range of measurements for each age group is so wide that normal children at 1 year and 16 years of age could have the same size foramina. Therefore, we cannot draw any conclusions from our limited serial data. MR venography has been used to study 17 patients with complex craniosynostosis (21), ranging from 4 months to 34 years of age (mean age, 7.3 years). Jugular bulb obstruction was found in 12 patients, but a variable relationship with tonsillar herniation and hydrocephalus existed, and no correlation was made with ICP measurements. Stenosis of the jugular bulbs was not consistently related to osseous narrowing of the jugular foramina on CT scans. This finding may be important, because it indicates that in selected cases, soft-tissue hypertrophy or encroachment may be the cause of jugular bulb stenosis, which might be amenable to endovascular dilation or stent placement rather than surgical foraminoplasty. Quantitation of dural venous sinus flow and velocity is also possible with MR venography by using a cine phase contrast technique. Superior sagittal sinus blood flow was studied by using this technique in normal children and in children with achondroplasia or obstructive hydrocephalus (22). Flow was shown to increase in normal children during the first 6 to 8 years of life. Reduced superior sagittal sinus flow was observed in the achondroplastic children but not in those with obstructive hydrocephalus, although the number of children studied was too small to achieve statistical significance. Nonetheless, noninvasive quantification of intracranial venous hemodynamics would be a useful adjunct to the imaging assessment of complex craniosynostosis and achondroplasia, particularly in patients who are likely to develop progressive venous outflow obstruction. Achondroplasia presents a precedent for the relationship between raised ICP and jugular foramen stenosis and its treatment; it is also a disorder that is mediated by a fibroblast growth factor receptor mutation (23). Like syndromic craniosynostosis, it is associated with hydrocephalus and raised ICP, with constriction of the internal jugular veins in the foramina narrowed by early closure of skull base synchondroses (10). In children with achondroplasia and craniosynostosis, invasive monitoring has been used to show persistently elevated superior sagittal sinus venous pressure despite decompression of the ventricles and lowering of ICP by removal of CSF via a ventricular drain (8). The children in that series also had venous stenoses and a pressure gradient between the superior sagittal sinus and the internal jugular veins, with development of a collateral venous circulation. Lateral sinus-to-jugular vein bypass operations were performed in three patients. Two patients also required insertion of a ventriculoperitoneal shunt to control ICP, but in the third, a reduction in ICP was achieved with the bypass procedure alone. Relief of raised ICP by surgical decompression of jugular foramen stenosis has also been reported in association with achondroplasia (9). We have shown that in complex and syndromic craniosynostosis, the jugular foramina are significantly narrower in patients with raised ICP than in those with normal ICP. This adds to a growing body of published evidence that intracranial venous hypertension is an important factor in the development of raised ICP and hydrocephalus in these children. Venography should form part of the routine MR imaging protocol for diagnostic assessment of children with complex and syndromic craniosynostosis. Quantification of venous hemodynamics may also have a role, allowing more accurate, noninvasive monitoring of change at follow-up studies. Future management strategies in appropriate patients with raised ICP should be directed at alleviating venous outflow obstruction, either by surgical or endovascular techniques. Prophylactic intervention may also play a role in children who have normal ICP but radiologic evidence of venous outflow obstruction if it becomes possible to reliably identify those patients who are destined to develop raised ICP and the related neurodevelopmental sequelae. Presented at the annual meeting of the British Society of Neuroradiologists, Bristol, England, October 2000.